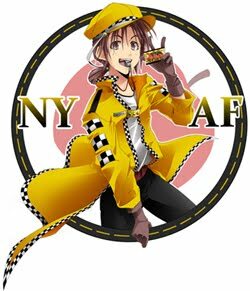 Well, the 2009 NY Anime Fest has come to a close. Had a great time. Going to post up some cool stuff in the days to come, including a surprise for the front page of the site ^^ You can check the Flickr feed I used while there. Tried to make it as live as possible but the darn iPhone's battery power kept things at a minimum. As for best cosplay of the event (other than my fiancee being Tifa)...check out this sick, sick Bumble Bee costume. See NYAF pictures at the official group here. who's that chick in the yellow and checkered clothing?